Friends of Film Athens - Events this week! The VHS Film Fest - tonight! FREE! Short films, prizes, fun! Screening the entries & awarding the winners at the Kid's Blue Carpet Matinee & Evening Blue Carpet Premiere. *Danielle & Mark from Film Athens will be there as judges! 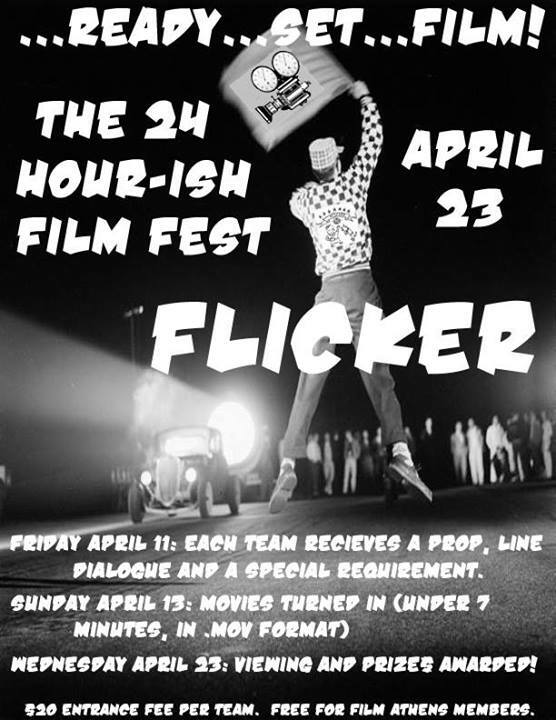 Team sign-up and drop-off will take place at Flicker . Teams will be given a Line of Dialogue, a prop and a special requirement. Movies will be turned IN! Swing by Flicker Theatre - drop off your video - save on the late deadline fee and postage! Or just come meet the Sprocket screw and hang out! Viewing and prizes awarded around 9pm-ish. Swing by Flicker Theatre - drop off your video - save on postage! Or just come meet the Sprocket screw and hang out!